As of Monday, April 9 total oil product stocks in Fujairah stood at a record 25.088 million barrels rising 7.8% week on week, reflecting an overall gain of 1,811 million barrels – led by an over 1.75 million build in heavy distillate stocks. The previous record since stock reporting began at the start of 2017 was of 24.400 million barrels seen on July 17, 2017. Stocks of light distillates fell marginally dropping 0.3% week on week. Total volumes fell 31,000 barrels to stand at 11.212 million barrels. 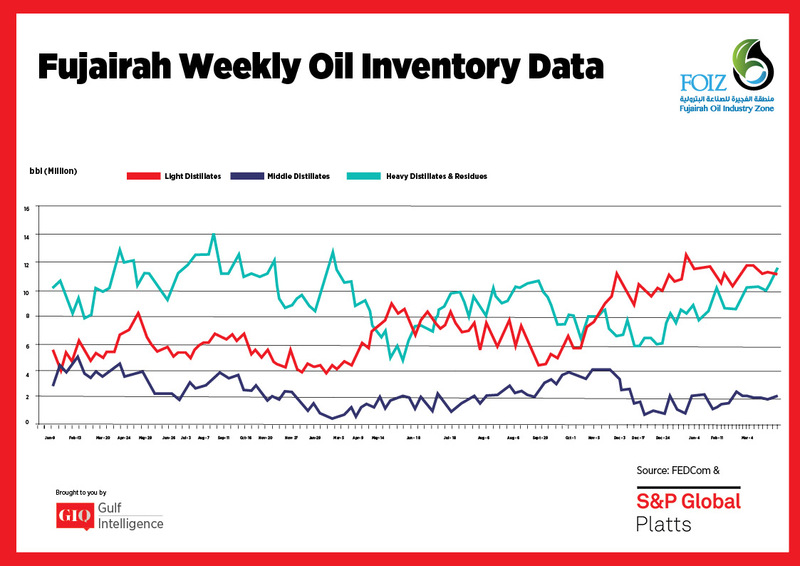 This is the fourth consecutive week that light distillate stocks have stood above 11 million barrels. The mood among market participants remained firm at the start of the week, with sources highlighting firm fundamentals in Asian gasoline. “The market so far has seen some good support on the supply end,” one market source said. “There still remains some upside on gasoline cracks, particularly as we approach May. The 92 RON physical gasoline crack to front-month ICE Brent futures stood at $6.86/b on Tuesday, reflecting a rise of $0.25/b week on week. 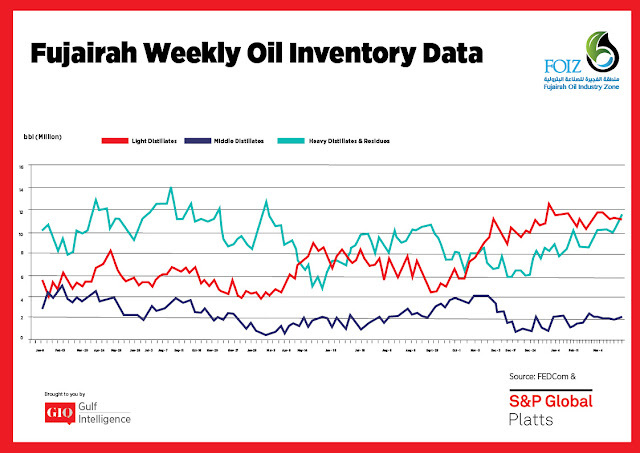 Stocks of middle distillates rose this week, having fallen the past three weeks, showing a build of 4%, with stocks rising by 82,000 barrels week on week to stand at 2.129 million barrels. Overall lackluster demand continued to weigh on sentiment, with the strong EFS denting arbitrage economics, sources said. Looking West, demand for ultra-low sulfur diesel remained lackluster in northwest Europe, with the expected seasonal uptick for commercial-use diesel yet to be seen. 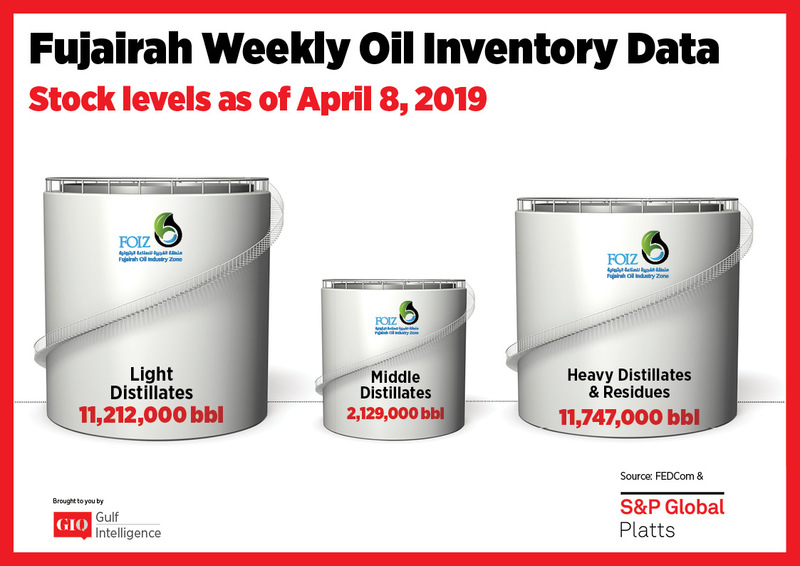 Stocks of heavy distillates rose 17.6%, adding 1.76 million barrels on the week to stand at 11.747 million barrels. This is the first time heavy distillate stocks have breached 11 million barrels since December 4, 2017, when a stock level of 12.314 million barrels was seen. The stock-build comes with IMO 2020 regulations limiting the marine burning of fuels with a sulfur content of more than 0.5% coming into place on January 1, 2020. As a result, the market is fast preparing new compliant fuels to test in advance of the new regulations coming into place in under 9 months. Looking at bunkers at the port - spot demand in the Fujairah bunker market began the week on a subdued note, trade sources said. 380 CST Fujairah delivered bunkers continued to show a higher price than Singapore, with delivered bunkers in the Middle Eastern port assessed on Tuesday at $433.75/mt a $1.75/mt premium to Singapore.